A magical place where you are surrounded by beautiful trees, shrubs and flowers, classical borders, modern planting, secret corners and long vistas. Just a stone's throw from Oxford nestles Waterperry Gardens, a magical place where you are surrounded by beautiful trees, shrubs and flowers, classical borders, modern planting, secret corners and long vistas. Made famous by Beatrix Havergal who established her School of Horticulture for Ladies here from 1932 to 1971, it's now home to 8 acres of beautifully landscaped ornamental gardens, a quality plant centre and garden shop, gallery and gift shop, museum and tea shop. Home to the renowned horticultural college between 1932 and 1971, the emphasis was on food production rather than spectacular ornamental gardens. Over the past twenty years though the gardens have developed and grown, and many new projects have been undertaken and completed. You'll now find a Formal Garden, the Mary Rose Garden, a Waterlily Canal and the Long Colour Border, and we recently planted a small arboretum in the meadow area beyond the canal. 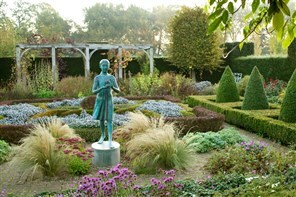 The gardens themselves are evidence of Beatrix horticultural virtuosity, in particular the classical herbaceous border. This remains an object of admiration to visitors by virtue of the gardeners continuing faithfulness to its original conception. Although the teaching school left its mark on the gardens, these were principally established for educational purposes, including the striking living catalogue of herbaceous plants. Yet, since the closure of the school, extensive developments have taken place in the gardens under the auspices of the present owners, the School of Economic Science, far beyond their scope when purchased in 1971. Today, Bernard Saunders and Mary Spiller are responsible for this development through their combination of artistic and horticultural expertise. This has resulted in a number of planted spaces that bring together geometrical and aesthetic principles with brilliant plant selection. The result is an uplifting and often surprising experience for visitors. These elements will remain uppermost in developments that are currently in the design stage and as the gardens continue to develop in the future.